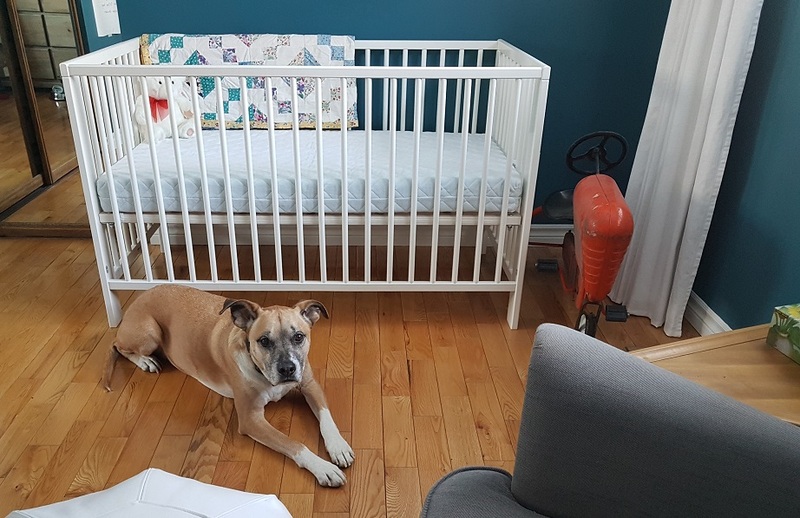 Today is the third post in the series of how we’re getting ready for our first baby and preparing our dog Baxter too. From crying to lotions to a blanket on the floor, the baby is going to bring (just a few) new things to our home! We’ve been working to introduce as many new things as possible to Baxter before our delivery day. That way he has fewer changes to process when the biggest new thing—the baby itself—arrives. To see all of the posts in this baby prep series, click here. If you have serious behaviour concerns or special needs particularly when adding a baby to your family, our best advice is to work with a reputable, professional trainer. As DIYers, it seems like our house is always changing. Baxter has learned to adapt and isn’t perturbed when a pile of lumber shows up in the front hall, or the air compressor kicks in to run the nail gun, or the house smells like paint—again. When our baby arrives, it will bring with it new sights, sounds and smells. Baxter’s easy-going attitude gives me confidence that he’ll adjust to these new additions fairly smoothly. However, for some dogs, changes in their environment can cause anxiety. When expecting a baby, it is helpful to introduce new things gradually and in advance to help minimize the amount of new things your dog encounters at once. From a play yard in the living room to a bassinet in the bedroom to a bouncy chair on a blanket in the family room, we’ve set up as many of the baby’s things as possible. We haven’t made a big deal for Baxter about any of the new additions. Like when we’re DIYing, the new items have just appeared, and Baxter has investigated or not as he wants to (mostly not). We still play fetch in the living room, and Bax has learned to work around the play yard. Like his attitude to everything else, it’s no big deal so far. The other sight we’ve been getting him used to is Matt and me spending time in the nursery. This is not a room we frequented a lot before, but that’s about to change. If Baxter seems interested in joining us in the nursery, we invite him in, making sure he seems comfortable and relaxed being in the room. 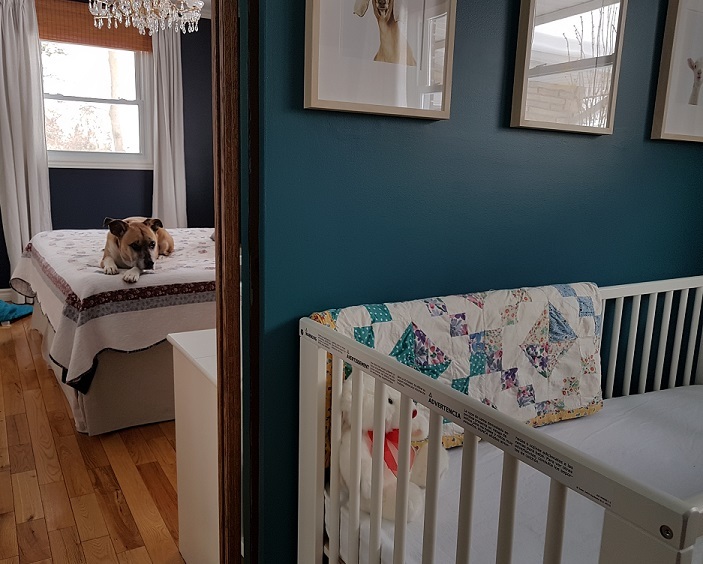 We’ve also opened the pocket door that connects our bedroom to the nursery, so Baxter can keep an eye on us from his familiar spot on our bed. Other sights: Hold a doll while sitting on the couch or in the chair where you’ll feed your baby. This will help your dog get used to your new routine and the sight of you holding something. Say the word baby and one of the first thoughts that comes to mind is probably crying. So we’ve been practicing for baby’s arrival by playing recordings of crying babies. Our goal is that the sound is relatively familiar and common for Baxter before the real thing arrives. Our trainer mentioned that for some dogs, a crying baby can sound like a wounded animal whining or crying. This can trigger aggressive behaviour. She emphasized that these are usually extreme cases where the dog often has other behaviour issues. If you see any anxiety or aggression from your dog in reaction to baby sounds, work with your dog gradually to slowly build his comfort level. Calm petting, massage, treats or distance are all good techniques to help him adjust. Consult a professional trainer for any reactions that cause you serious concern. Baxter’s usual reaction if there’s a sound he doesn’t like is to walk away and find a quieter spot in another part of the house. He stays calm, doesn’t appear anxious or bark in response. That is the exact response that I want. Babies often bring visitors and visitors usually knock or ring the doorbell. If your dog gets frightened or excited by these sounds, practice encouraging calm reactions before the baby is born. Also, consider posting a sign at your front door asking visitors to call when they arrive instead of knocking. See our post: How to keep your dog calm at the door. Musical or noisy toys are definitely another concern for some dogs, especially as the baby grows. As with anything new, try to introduce toys slowly. Remember your dog’s ears are sensitive and try to give him a break from the noise every so often. Dogs and babies – new smells! Smell is a dog’s main way of interacting with the world. It is a really important way for him to get to know the baby. One of the most interesting things our trainer said is that Baxter is probably already smelling the baby—or at least smelling a different scent from me. That’s a pretty cool introduction. Beyond the baby itself, there are other new scents—powders, lotions, milk, not to mention diapers. While I’m definitely not bringing dirty diapers into my house sooner than I have to, I can easily try out some of the lotions and creams in advance. That way Baxter begins to associate their scent with me and they become part of the usual smells of our house. Other scents: Many people recommend sending a blanket home from the hospital. 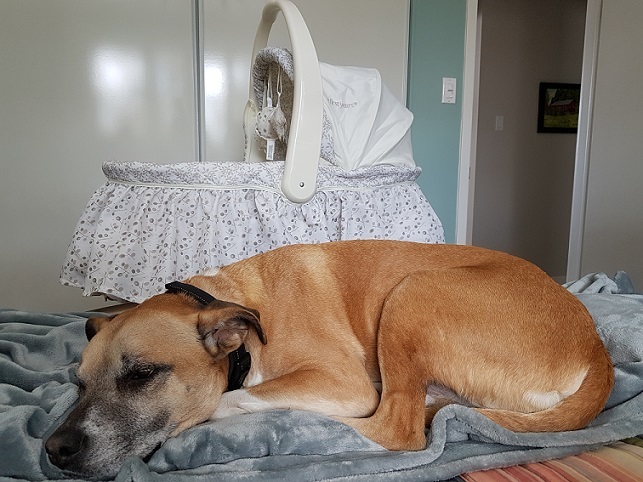 That way, the dog can smell the baby on the blanket before meeting the baby itself. Both our trainer and some of the books I’ve read say that this is unnecessary. It may actually lead to unwanted behaviour. Make the choice that is best for your family and your dog. I’ll be talking more about our strategy for Baxter and baby’s first meet ‘n’ greet in an upcoming post. Thinking in advance about the sights, sounds and smells that come with a baby and helping Baxter to be comfortable around these are a major part of my overall goal of keeping everyone happy and relaxed during this big change in our lives. How does your dog react to changes in his environment? 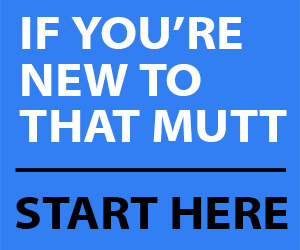 What are your tips for helping your dog adjust to new things at home? Julia Thomson is a blogger at Home on 129 Acres where she writes about her adventures of country living and DIY renovating. She and her husband live on a 129-acre farm in Ontario, Canada. Another great post with actionable advice, Julia. The idea with the doll on the couch and playing sounds of crying babies sound like a good way of getting Baxter ready for the new hooman in his life. I think it’s generally a good idea to keep our pups mentally sharp, that way they’ll be able to better cope with changes in their environment. I started renting out part of my house on Air B&B and it’s been a great socializing experience for the pups – lots of new people, things, and smells. Just wrote about it on the blog. Air B&B visitors would definitely bring a whole lot of new into their environment. Resiliency, flexibility, adaptability are important for a lot of reasons and there are a lot of different ways to cultivate them in our dogs. Thanks for sharing your experience. I liked the part about holding a doll and playing plenty of baby crying sounds in advance too. Ace is not fazed by anything, never really has been. However, Remy tends to be a little nervous about anything new and then very curious. No plans for a baby here but if we do we would definitely be following all of these tips for Remy. Every dog reacts differently, and sometimes they surprise you when they’re faced with the real thing. I do think the prep can make a difference for dogs who might be nervous or curious to make them less so around the real thing. Babies are definitely weird for our pets. They smell, sound and behave much differently than other humans and as such are, I believe, quite perplexing to them. The more we prepare them (and us for that matter) in advance the better. It can also depend on the breed. Some get along with them better than others – it’s best to consult an expert if there are some special preparations or considerations to be taken. Thanks for your comment and advice on seeking expert help if needed. Our trainer has been very helpful and encouraging for me. One of the things I read questioned whether dogs recognize babies as humans. Adult humans don’t change or age for dogs. Babies move, sound and act so differently–and they change a lot. I’m interested to see how Baxter adjusts as the baby changes and grows.